Reno Comic Con— Now with more FREE HODABEAST! 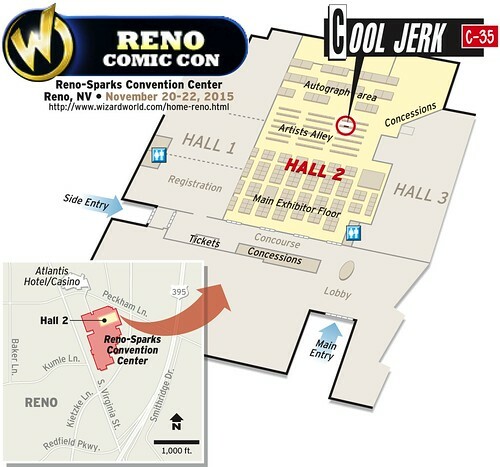 Reno — the birthplace of Cool Jerk and Doc Splatter — is hosting its second-annual comic convention next week, and Cool Jerk will once again be there! 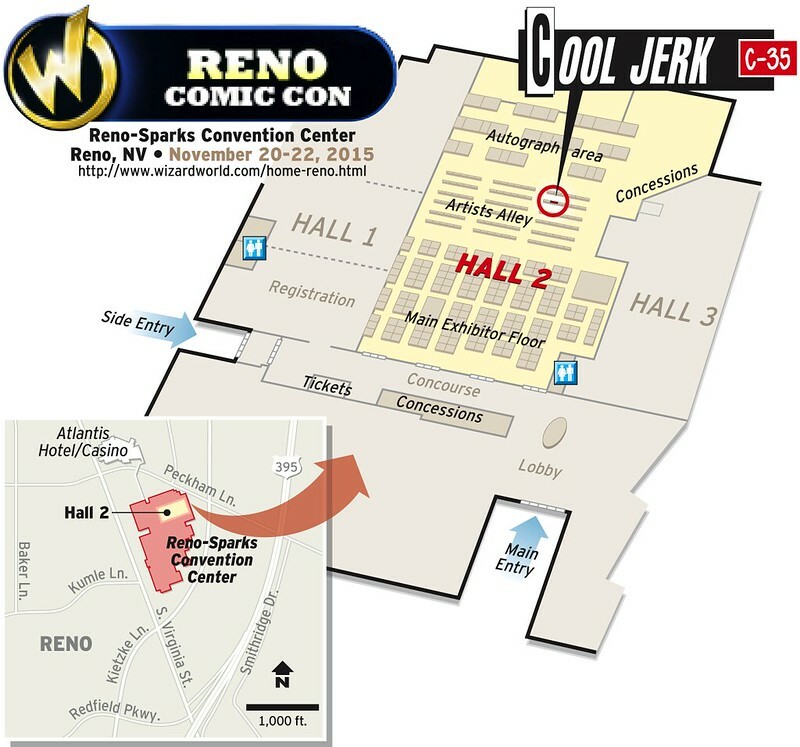 Reno Comic Con — part of a series of conventions put on by Wizard World — will commandeer the Reno-Sparks Convention Center this Friday through Sunday, Nov. 20-22. I’ve been given the status of “Special Guest” so that means free limo and I get to cut to the front of any buffet line in town. I’ll have copies of all my Cool Jerk books, including the Jerkopædia— The Official Visual Style Guide to Cool Jerk which debuted this summer. Further, I’ll have all sorts of Cool Jerk effluvia you’d expect to see at a comic-con, such as Canvas Panels, t-shirts, sketchbooks, posters, buttons and stickers. Doc Splatter Ominous Omnibus? Hell yeah I have those, too! All items are going to be discounted so THIS IS DEFINITELY THE TIME TO SHOP! Nevada sales tax? I got your back— it’s all part of the price! I mentioned FREE HODABEAST (Cool Jerk Vol. 1), so here’s the deal: I’ll have 10 copies to give away each day… FREE with any purchase and if you LIKE! Cool Jerk on Facebook! Buy a book? Free Hodabeast. T-shirt? Free Hodabeast. A $1 glow-in-the-dark Cool Jerk button YOU CHEAPSKATE? Free Hodabeast. 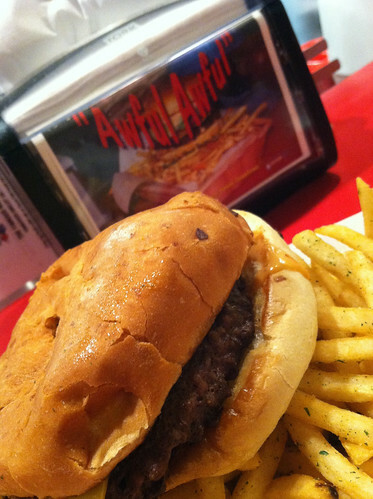 That’s a $12 value, friend… a perk of being a fellow Northern Nevadan. Click it to Truckee Meadows-size it! Need directions? Here’s a locator I whipped up while eating an Awful-Awful. So bring your Christmas shopping list and some folding money (I also take credit cards) and come by the Cool Jerk outpost C-35 in Artists Alley, on the right side of Hall 2 back by the celebrity veal pens. Remember: Only 10 free Hodabeasts per day, so plan accordingly! 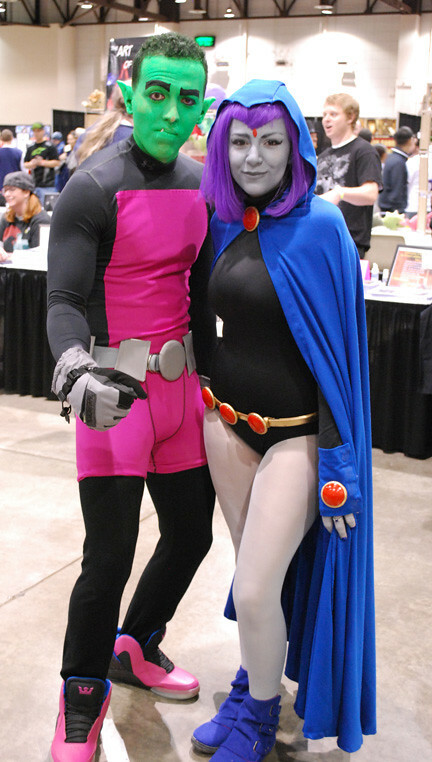 Reno Comic Con Photo Recap! 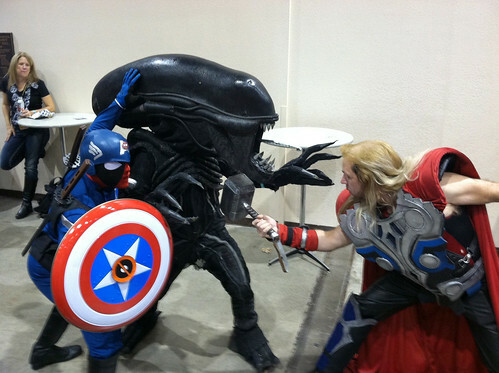 So Reno had its first comic con (it should be christened “The Biggest Little Comic Con in the World”) and it was terrific! Darlene stayed in San Diego so I flew solo (actually, I drove, which is always a preferred option as I can bring more books and t-shirts to sell). 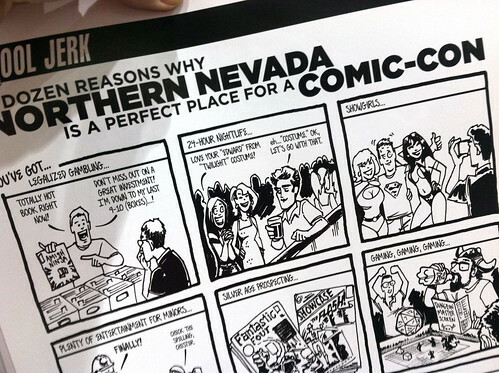 I was surprised — and a little humbled — that so many attendees remembered Cool Jerk from its days in the Reno Gazette-Journal (1991-1996) and even its original incarnation “Like, For Shore!” when it ran in the UNR Sagebrush (1987-1990). One attendee told me that whenever a new Sagebrush came out, he always went straight to the comics and always read “Like, For Shore!” first. That was awesome to hear. 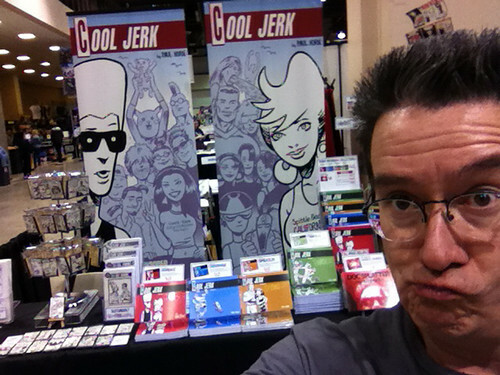 So I sold t-shirts, canvas panels and many books, almost running out of Cool Jerk Vol. 2: Chickadoowa. 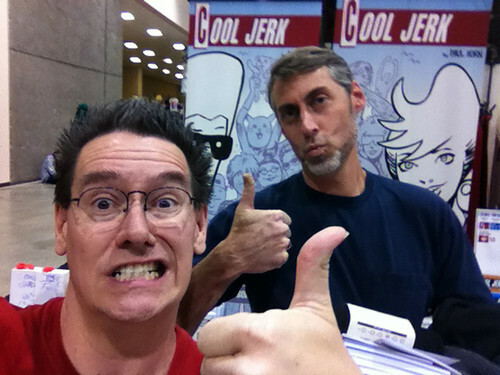 I caught up with fellow cartoonist from college days, Brian Foote, and that alone nearly made the trip worthwhile. Well, I could bore you with all this stuff but instead, let’s go to the photo-recap! I’ll start with my stop at the Reno Nugget for one of their Awful Awfuls. 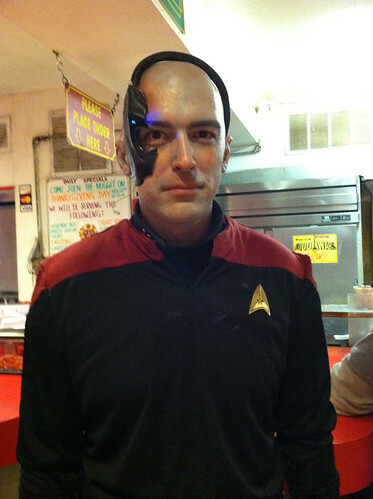 This was the night before the convention, and who should I see in line ahead of me…? 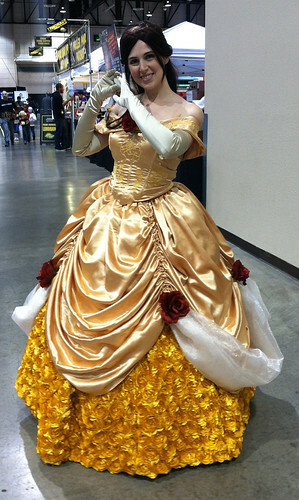 One of the first — and best — cosplayers I saw on Friday was this gal dressed as Belle, who roadtripped from Virginia (!) just for this show! 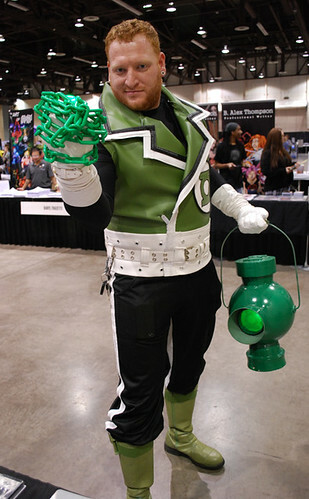 And I’ve seen plenty of Green Lanterns in my day, but I think this might be the first Guy Gardner. Bravo, tough guy! 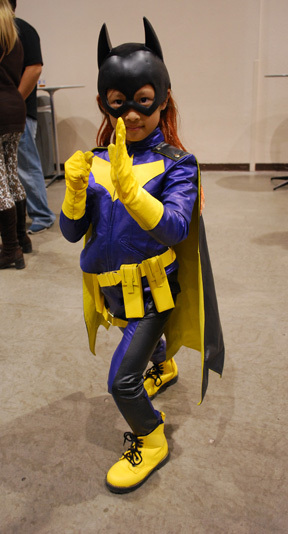 And here’s one of the best: Batgirl in her new “Burnside” outfit (complete with snap-on cape and respectable combat boots)! 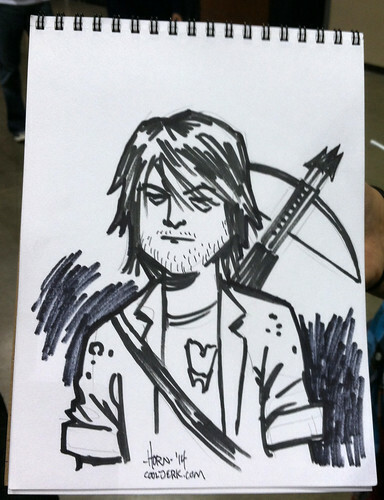 More costumes to come, but here’s where I’ll show you a 3-minute Sharpie™ sketch of Daryl from “The Walking Dead.” Norman Reedus was one of the many special celebrity guests in attendance. This was for the daughter of a long-time Cool Jerk reader and friend Will Bento. Here’s the top part of my first-ever convention-exclusive print. Can’t show you the whole thing because, you know, secret punch line. They went pretty fast but I still have about 8-10 left. Buzz me if you’d like to buy one! $15 signed, and that includes shipping and sales tax. Meet Robert Harris. He’s not only been a longtime Cool Jerk reader, but also remembered a bunch of storylines from old “Like, For Shore!” strips (like when I had Rocket and Sunset rent out their guest rooms to Britpop New Wave quartet Fuzzbox). 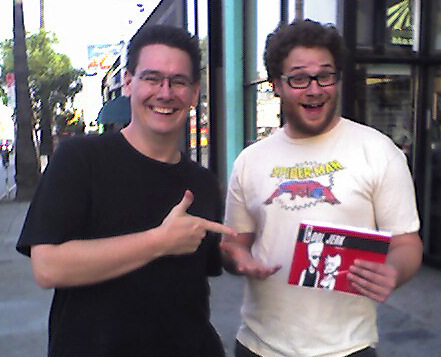 Plus, he also “guest-wrote” one particular Cool Jerk strip from 2007. It was awesome to finally meet him in person and save him a bunch of postage and sales tax when he bought up a stack of goods. Thanks again, Robert! 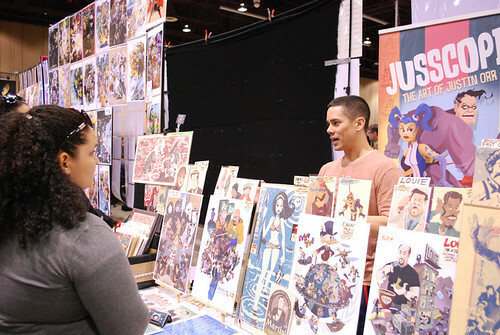 Here’s my bro Justin Orr, who was the only other exhibitor I knew (we met at WonderCon a bunch of years ago, when he was my next-door table neighbor). I always look forward to visiting with him and talk about influences, from Frank Frazetta to Charles Harper. He hails from the Bay Area and I recommend his art highly. Click to get right up in there! 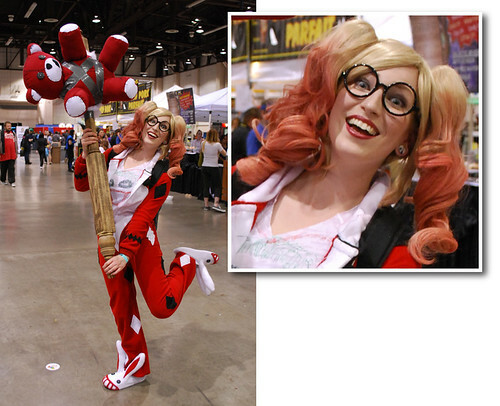 …and slumber party variant of Harley Quinn. One of my favorite cosplayers at Reno Comic Con — take a look at her expression. SHE WAS REALLY INTO IT. 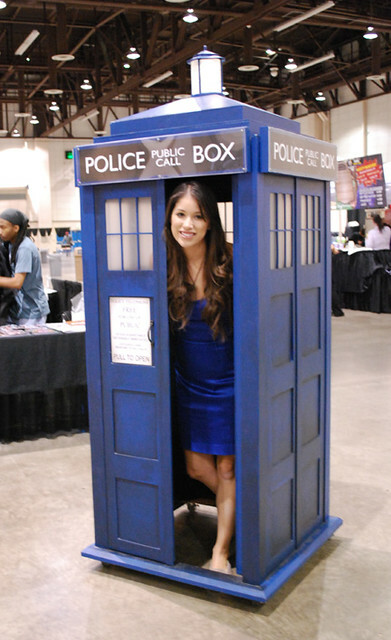 This gal built a FREAKIN’ TARDIS out of wood and rolled around the convention floor while inside. She got Karen Gillan (also a special guest) to climb in and autograph it. 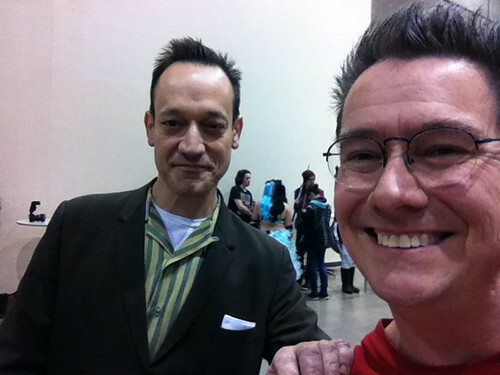 And to wrap things up, on the last day, Ted Raimi stopped by the table to say hi. In all, it was a terrific show and a great turn out… especially for Reno. I’m already looking forward to next year (also the third weekend in November). 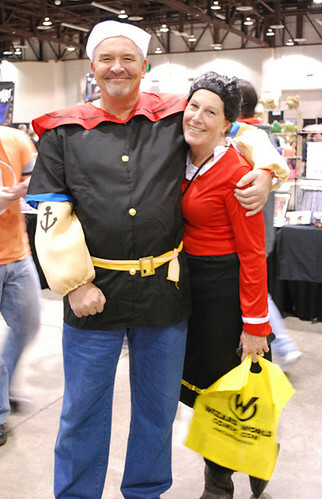 Thanks again to the Wizard World crew for making this happen! 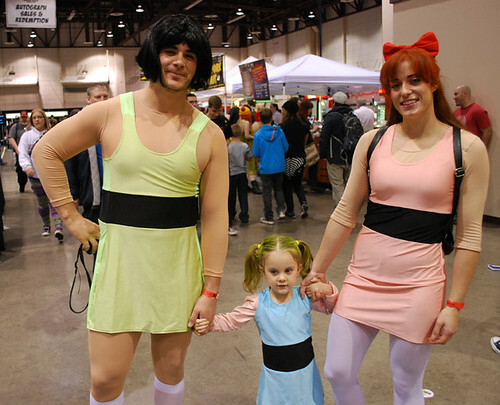 Reno Comic Con— I know, right?? I never thought I’d see the day, but my old stomping grounds (and the birthplace of Cool Jerk and Doc Splatter) is hosting its very own comic convention this week. 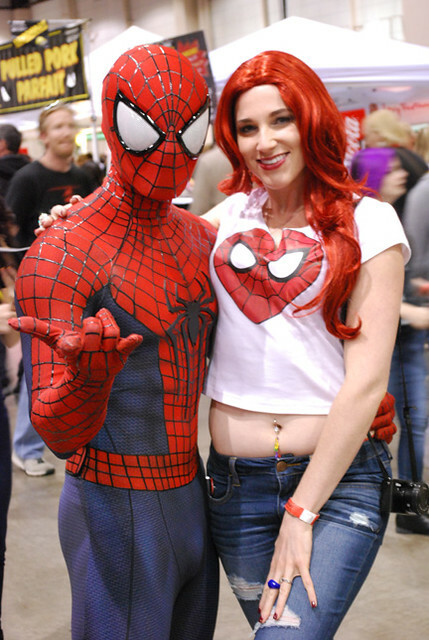 Reno Comic Con — part of a series of conventions put on by Wizard World — will mark its debut in the Truckee Meadows this Friday through Sunday, Nov. 21-23. I’ve been given the status of “Special Guest” so that means I can show up drunk and take anything I want from other people’s tables. Crazy, right? Home team has its privileges! 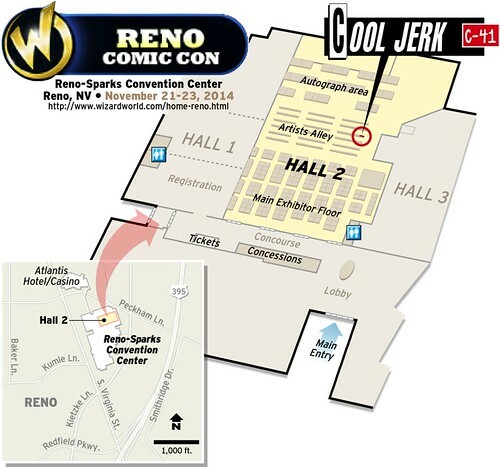 Last time I had a book signing in Reno was 2011, and since then I’ve released Cool Jerk Vol. 4: Thinkulus. So all of you completionists will certainly need to swing by my table to pick one up! Further, I’ll have all sorts of Cool Jerk effluvia you’d expect to see at a comic-con, such as Canvas Panels, t-shirts, sketchbooks, posters, buttons, stickers and my ever-grinnin’ mug. All items are going to be discounted so THIS IS DEFINITELY THE TIME TO SHOP! Nevada sales tax? I got your back— it’s all part of the price! Click it to expand-a-size it! Need some help getting there? Here’s a locator I whipped up while simultaneously placing an order at Port of Subs. So bring your Christmas shopping list and some folding money (I also take credit cards) and come by the Cool Jerk outpost C-41 in Artists Alley, on the far right side of Hall 2. I expect to see a bunch of friendly, familiar faces… hope yours is one of them!